A focus on an open and light design, the opportunity for social interactions, and comfort on the brink of luxury are all aspects of these hotels and mirror a similar trend driving airport renovations. Airport hotels have always been necessary but unloved stopover spots for the depleted traveler, places to shower, rehydrate and let the body recuperate from the merciless rigors of flying. 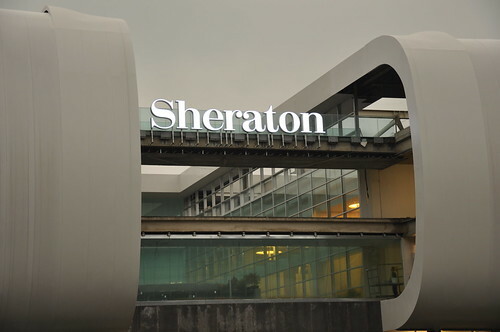 The Sheraton Malpensa Hotel in Milan fits in well at the entrance to the world capital of design. Photo by Paolo Tedesco. Yet checking into the Hilton Frankfurt Airport, which opened in December turned out to be much more. It’s an example of the emerging generation of airport hotels that are intended to function as destinations, real places where one might reasonably stay longer than a single night. The increasing sophistication of these hotels parallels a reemergence of civilization—daring architecture; edible food—in airports themselves.